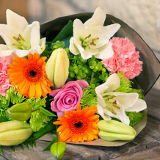 Free delivery and discount codes to use when ordering local fresh florist delivered flowers at iflorist.co.uk. Iflorist offer a beautiful range of quality online flowers that are available for international delivery or anywhere in the UK. Same day delivery is available if ordered by 3pm from the iflorist large network of florists across the UK. Customers can also choose from a range of chocolates, wine, champagne and other gifts for any occasion. Iflorist.co.uk is an online flower delivery service offering a range of flowers and plants throughout the UK. The website has a similar look to many other online flower sellers on the internet; it has bright, vibrant images which seem to give a good representation of the flowers to purchase, although they are nicely arranged in vases for illustration purposes. There are several different options available depending on what is required. Flowers can be delivered directly by post which I believe is the next day option. Flowers can be ordered for delivery the same day which are handled by a local florist network. What I couldn’t find was a useful description of the delivery costs either in bullet list or table format. It is always useful and a customer service necessity to provide accurate delivery costs that can be viewed before purchase. On a positive note all the products are clearly marked up with the pricing with the delivery type i’.e. next day or same day flowers. The customer service advice number can be found right at the top of the homepage which easy for the user to find. There is a useful FAQ section where all the commonly asked questions can be found. I partially take back some of the criticism about the delivery information as there is a section dedicated to delivery here. Payment options are by credit or debit card and by PayPal checkout. iflorist is well supported by many of the main social networks such as Google+ and Facebook. These extensions to the site are great for keeping in touch with the latest offers and products.